A Taiwanese China Airlines plane has burst into flames at Naha airport, on the Japanese island of Okinawa. All 165 people on board survived, with some escaping just seconds before the plane exploded into a huge fireball. TV images showed flames and smoke billowing from the Boeing 737-800, and the pilot jumping out of the cockpit window as the plane exploded. Some reports said the left engine of the plane caught fire, but the airline said the cause was not yet known. "Then the crew on board immediately took the due procedure to evacuate all the passengers." The plane had been on a routine flight from the Taiwanese capital, Taipei, to the southern Japanese island of Okinawa, carrying 157 passengers and eight crew. Airport officials told Kyodo news agency that black smoke and fire could be seen billowing from the plane just eight minutes after it had landed. 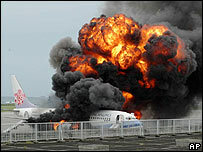 Once the fire had been extinguished, an hour later, the plane was found to have broken into two. Japanese TV initially reported that two crew members were rushed to hospital, but airline officials said all eight were safe. The BBC's Caroline Gluck in Taipei says the incident is a major setback for the Taiwanese flag carrier, which once had one of the worst safety records for international airlines. The airline suffered several crashes during the 1990s, and in 2002 one of its fleet crashed into the sea near the island of Penghu with 225 passengers and crew on board.